In this write-up, we will learn about subqueries in SQL Server. Subqueries are also termed as Nested queries. Subqueries are nothing but literally a technique of nesting one query within the other. If you make nested queries up to multiple levels, then it will be the worst case scenario in your project and will affect the performance. Subqueries are also termed as Nested queries. Let’s see a simple example of Subquery. In subqueries, we can use any number of tables like we’re doing here. We’re using the same table twice. So, you might get confused about the difference between Joins and Subqueries. 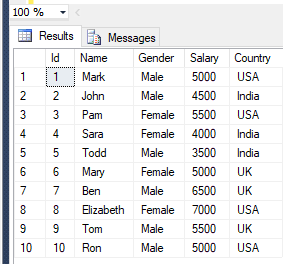 Joins let you include columns from all the tables in the query. And subquery only includes the columns for the table in the outer query. So the explanation of the above point is that when we’re working with joins, we can include any column of any table in the joins query. Whereas when we’re working with subqueries, we can just select the columns of the outer query, as we have here. Joins are easier to use and their performance is faster, whereas, Subquery has this benefit over the join that we can pass the aggregate values to the outer query with the help of a subquery. This is the join query. Now, let’s write the same query in a subquery. Another example of Subquery is where we’re applying the subquery at WHERE clause. And we can put the same query in a little bit more different way. Co-related queries are a type of variation of subquery or nested query. Both (co-related queries and subqueries) have outer queries and inner queries. But the big difference is in co-related queries that our inner queries also referencing the outer queries table. And if we write the same query in [Subquery]. Look here, in subquery, both inner query and outer query are independent of each other. There are no references. Now, you might be wondering how this query works actually. So for demonstration, let's see the below code. Now let’s take a look at this query. Look in the inner query we’re referencing the outer query table. So in the first iteration, let’s say e1,.Salary is 5000 and the check is WHERE e2.Salary is greater or equal to e1.Salary. So we’ll find 7 matches. And the Count (e2.Salary) will become 7 which is not equal to 2. It means 5000 is at the 7th position in our table. Similarly, let’s suppose e1.Salary value is 6500 which is greater than and equal to 2 matches in the complete table. Count(e2.Salary) will become 2, it means it is the 2nd highest Salary. Now let’s try one more time, e1.Salary is 5500. And we want to find the 3rd highest Salary. And obviously, it is the 3rd highest Salary. And now, our problem is solved. There is even a replication of Salaries multiple times in the table.